Get the right data to improve your Facebook marketing results. Get a complete and latest view of the state of your Facebook Pages. See key metrics like how many fans and followers you have, the number of posts you posted, total engagement on your posts, and much more. Compare this data with previous periods to see your progress and also check historic data to get a perspective. Understand the daily/weekly/monthly growth of your facebook audience by tracking new likes and unlikes. Also understand if new fans are acquired organically or if the acquisition was a result of paid campaigns. By analyzing audience growth trends, you can understand which campaigns are bringing you the most fans. In case of unlikes and decrease in fans, you can analyze what event/activity might have triggered. Check Your Audience Growth Now! Great a detailed, periodic breakdown of complete audience engagement. Find out how many fans liked or reacted on the page, the number of comments the page attracted and the number of shares for the posts posted on the page. Improving audience engagement signals proves that your Facebook marketing strategy, including content and campaigns, is working. Decreasing or flat engagement means you need to rethink your marketing strategy. FInd out when your fans are active the most. Get an hourly and daily breakdown of the number of fans that are online. Use this data to optimize your posting schedule so that you can maximize audience engagement. Check Your Optimal Time Now! Dig deeper into your fan and audience composition. Find out which countries your fans are from, and also know how many of them are males vs females. You can use this data to streamline your Facebook content strategy. You can further use this data to localize promotions and add regional flavors to overall social media strategy. 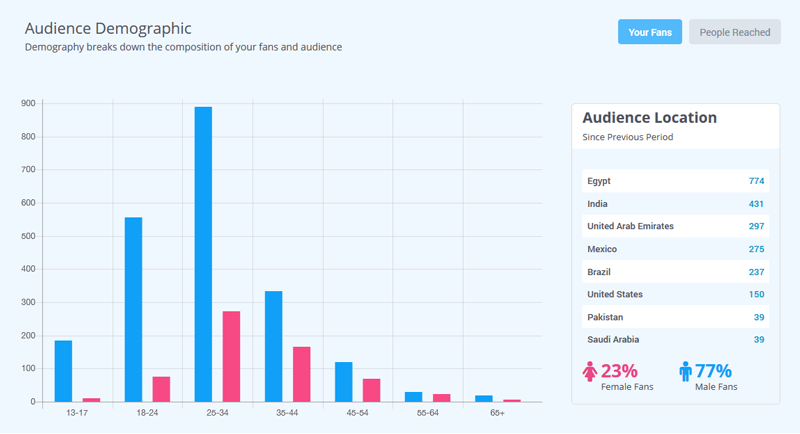 Analyze Your Audience Demography Now! Discover how each and every post performs. Understand what content reaches the most audience and which posts get the most likes/reactions, comments and shares. Reshare your most successful posts right from Facebook analytics page. By analyzing trends in post-performance, you can create content and promotions strategy that is backed by solid numbers and not just guesswork and hunch. Find out who your most active fans are. Get a list of top commenters, top likers and top sharers. Open their Facebook profiles directly from the analytics page and engage with them to acknowledge their contributions. You can also analyze this data to identify what kind of content these active fans would like, and further strengthen your Facebook marketing strategy. Check Your Top Fans Now! At a glance, get a complete picture of which hashtags work the best for your content and your audience. The size of a hashtag in the cloud indicates the amount of engagement the corresponding content generates. By frequently and effectively using popular hashtags, you can drive more engagement from existing fans and also attract new fans. Find Your Popular #Hashtags Now! Download a PDF analytic report of your Facebook page’s performance and measure your return on investment. SocialPilot provides you a ready to download PDF report with thorough analytics of your Facebook page including total engagement, likes, fans and visitors you have. Now, you don’t need to waste hours in making presentations. These reports are full of graphs, charts, in-depth Facebook audience insights and much more to declare your progress among your team or clients. You can use this data to monitor areas demanding your utmost attention and to prioritize your efforts. Go further with Facebook page insights showcasing your each post performance to analyze your posts generating highest engagement. Sign up for a 14-day free trial to access powerful Facebook Analysis.